Those felons with experience and interest in flying might think of becoming a helicopter pilot. 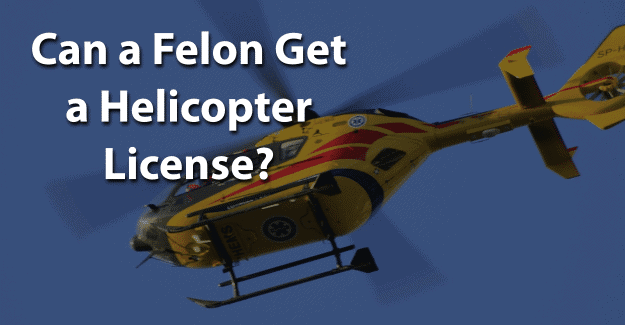 This blog post will address the issue of whether a felon can get a helicopter license. What is a Helicopter Pilot? What is a Helicopter License? What is Required to Get a Helicopter License? A license is issued by a state agency to practice a profession and is required in order to call oneself a licensed professional. Under a licensure system, states define the practice of a profession and stipulate that these tasks may be legally performed only by those who are licensed. Licenses are legally required by the government to work in occupation. A helicopter license shows that someone has specific knowledge or skill necessary to fly a helicopter. This type is for flying a helicopter for entertainment or individual use only. This type is for commercial purposes. Flight instructor. This is for someone who wants to provide pilot training to others. Flight training consists of in-air flight time with an FAA licensed pilot. An applicant must accumulate at least 40 hours of flight time, including ten hours of solo flying. Following ground school and flight training, an applicant must take and pass the FAA written and flight exam. Qualifying as a helicopter pilot also requires logging at least 1,500 hours as a Pilot in Command (PIC) of a helicopter. A background check is conducted through the FBI and involves a fingerprint identification. Any gap in employment for more than six months in the past ten years must be explained. This is a potential trouble spot for felons who have been locked up for a number of years. To be successful in their pursuit of getting a helicopter license, it’s essential for felons to be honest about their background. Being dishonest about felonies could cause a felon’s good moral standing to be questioned. Having their felony expunged can give felons the chance they need to begin with a clean record and succeed in getting a helicopter license. When a felon has his or her record expunged, he or she can honestly state on any application that he or she has not been convicted of a crime. It’s a significant challenge, but it might be worth it for a felon who wants to get a license to fly a helicopter. Having his or her record expunged and also documenting any training programs or additional education could make the essential difference in a felon succeeding. What do you think about this blog post? Have you or someone you know been in the situation of trying to get a helicopter license with a felony? What was that like for him or her, and how did he or she achieve success? Please tell us in the comments below.